Posterior reversible encephalopathy syndrome (PRES) is frequently seen in hypertensive crisis due to altered capillary membrane permeability. Concurrence of GBS with PRES is rare. We reported a 35-year old Caucasian woman who presented with seven days of ascending paresthesia, weakness, and severe back pain; examination disclosed absent deep tendon reflexes and weakness. Findings of …... Objective: To characterize a cohort of patients with the signs and symptoms of posterior reversible encephalopathy syndrome (PRES), but with clinical and radiologic involvement of the spinal cord. Posterior reversible encephalopathy syndrome (PRES) is an acute neurological syndrome clinically characterized by onset of headache, nausea, emesis, visual disturbances, seizure, altered mental status, or focal neurological defi-cits, such as hemiparesis, and is considered to be triggered... The ophthalmologist may be called upon to evaluate visual loss in a patient with posterior reversible encephalopathy syndrome. Familiarity with presentation and clinical management is imperative, as visual loss is often reversible with prompt treatment directed at causative factors. Abstract. Posterior reversible encephalopathy syndrome with stroke is very rare in puerperal women. A 36-year-old nulliparous woman with both rheumatoid arthritis and recurrent pregnancy loss, probably due to a high titer of anti-phospholipid IgM antibody, was referred at 10 weeks of gestation.... Posterior reversible encephalopathy syndrome (PRES), also known as reversible posterior leukoencephalopathy syndrome (RPLS), is a syndrome characterized by headache, confusion, seizures and visual loss. 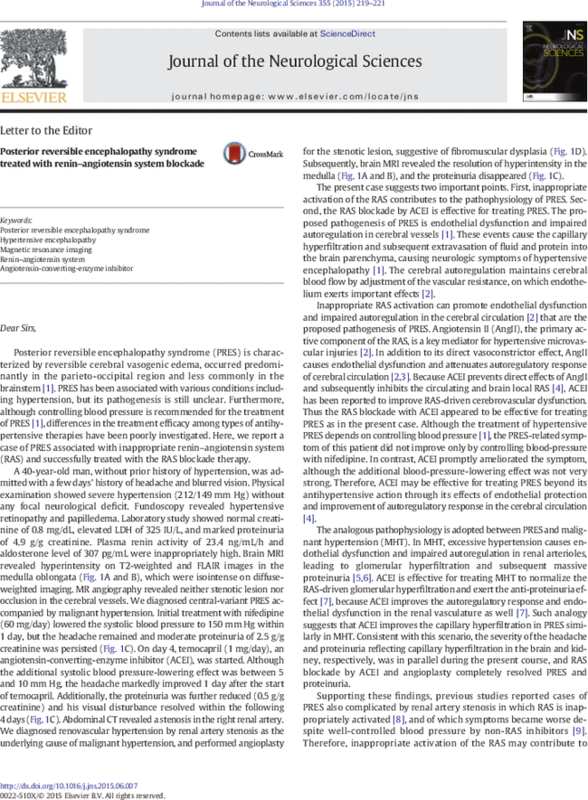 Posterior reversible encephalopathy syndrome (PRES), as the name suggests, is a constellation of symptoms caused by reversible ischemia most commonly of the posterior cerebral vasculature, thus affecting the parietal-occipital region.